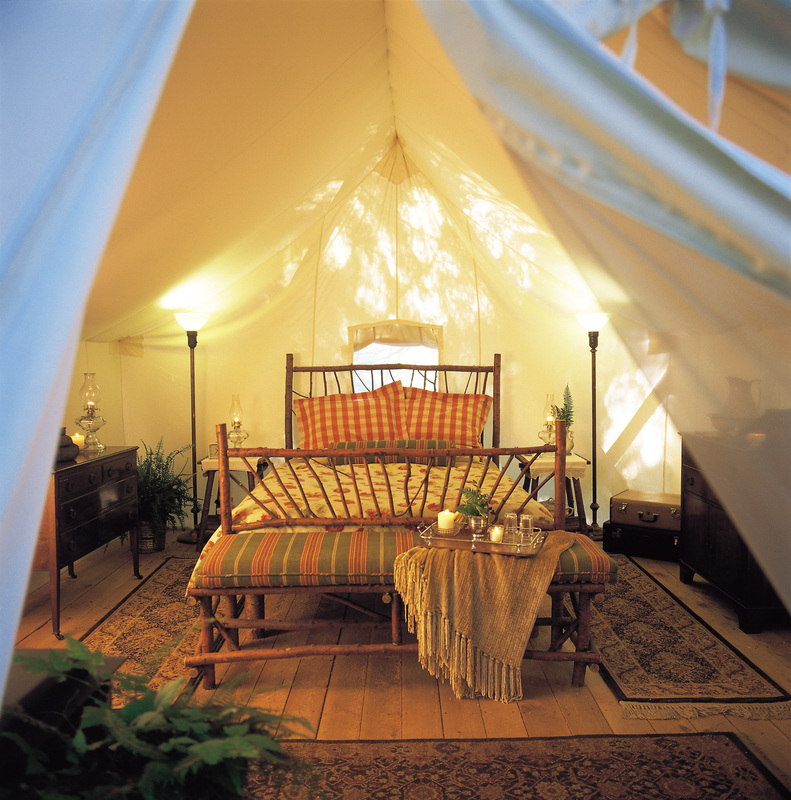 Glamping is “glamorous camping.” The appeal of glamping is that one gets an immersion into nature but without (what non-campers consider) the annoyances – lack of toilets, uncomfortable sleep, no heat and basic food and drink. Generally, glamping is insanely expensive and accessible only to adults. As you can plainly see, this is far nicer than many five-star hotels I’ve stayed at! A three-night all-inclusive stay here, however, will cost more than $5,000 per person in high-season. So, yes, I’d love it. But it’s not happening any time in my future unless I win the lotto. However, I was recently introduced to an amazing place that I will definitely be taking my family to. And if you’re like me – love nature, but simply don’t have the skills to survive out there – then I thought you might like to know about it too. Québec’s Zoo sauvage of St-Félicien offers a “Walking adventure in the Land of the Caribou” experience that is so ideal for a family that I can barely contain myself! Whether you’re a grandparent, a camper wanna-be or just someone who wants to share an up-close nature experience with your children, the Zoo sauvage makes it all very accessible. The complete experience comes at a price tag of $265 per person, and is recommended for ages 6 and up. Although pricey, I see it being comparable to spending a full day at Disney Land, with accommodations, food and activities. 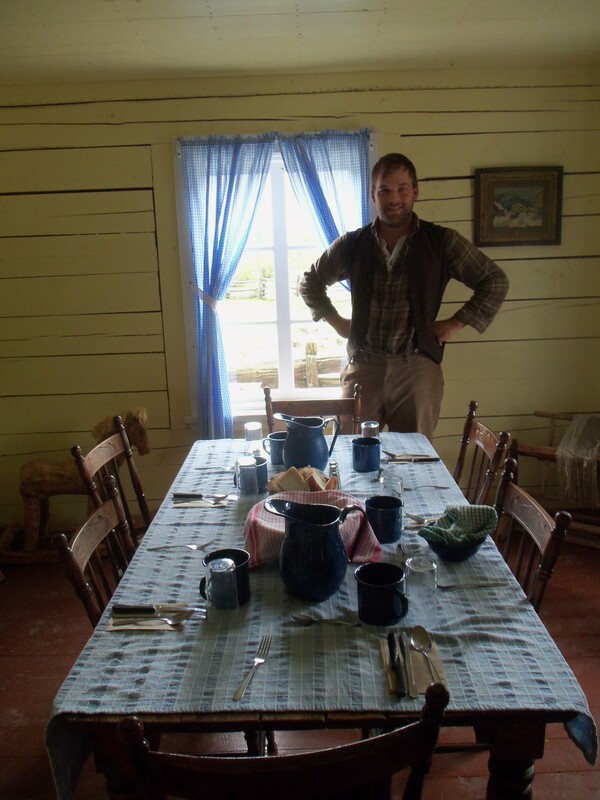 For lunch, you will stop into a pioneer-era farm, where Philias Tremblay will greet you and show you around his property. While at his farmhouse, you’ll be treated to a traditional meal of soupe gourgannes (broadbean soup), roast pork and potatoes, and blueberry pie. From there you leave “civilized life” and head into the forest. As you hike towards your campground, the guide enthusiastically teaches the kids (and adults!) 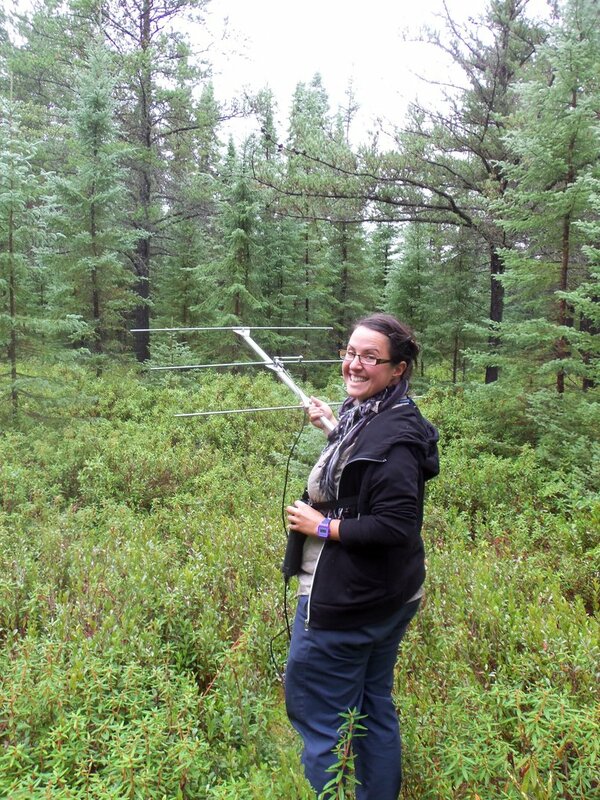 about the different flora and fauna of the boreal forest until you arrive to the camp. While it’s no “celebrity glamp,” it certainly seemed like heaven to me. I walked into my traditional canvas prospector tent and immediately lay down because it was so inviting! A mattress and sleeping bag had been laid on top of a bed of balsam needles. I closed my eyes and inhaled the scent. In one corner of the tent there was a stove, while another provides a basin of water and hand-made blueberry goat’s milk soap. 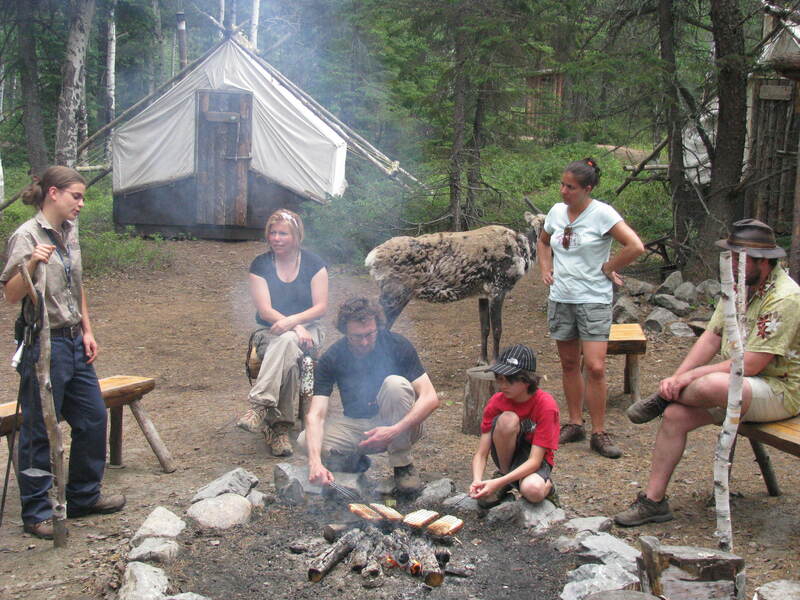 In the picture below, you can see one of the prospector tents in the background as well as the center campfire area. 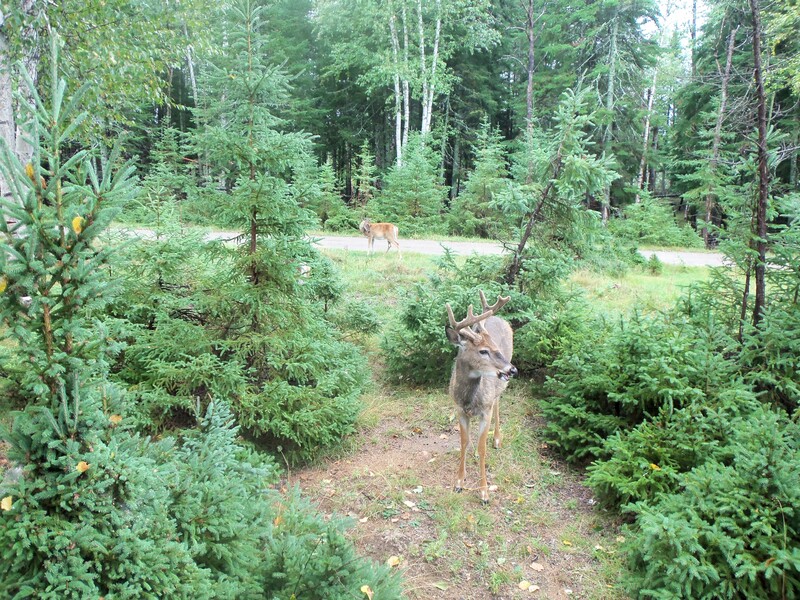 And yes, that is a caribou in the picture that everyone is ignoring! You start to get so used to them wandering around that they just seem commonplace. Before dinner, you and the family can take a sunset canoe ride on a nearby lake. While the adults paddle, the kids can play “spot the animal.” We were surprised to find an enormous moose hidden behind some bushes on an island and we also saw the largest black bear I’d ever seen rambling along the side of the lake. Back at our camp our guide (whom I adored), started a camp fire and offered us each a beautiful cold beer while she began to prepare dinner. Yes, you read that right – you don’t need to cook or clean out in this neck of the wilderness! That night, after I’d stuffed myself full of fresh salmon trout, potatoes, vegetables, and sugar pie, I sipped my wine and knew I’d found my type of camping! After dinner, the guide invites her guests to don some night-vision goggles and go animal trekking. Unfortunately, it was pouring rain on the night we were there, so I didn’t get to do this activity. But I would imagine it’d be the highlight for any child. After this, the group starts to pack up. Your luggage is taken back to the front reception and you are able to have a “backstage” view of the zoo – areas where regular guests are not allowed, the most interesting of which is the veterinarian building. Here, one gets a chance to be very close to the animals and even pet some of them. After this, you and you and your family are free to wander about the entire zoo. Celebrating its 50th year, the zoo, in and of itself, is worth at least a whole day’s visit. Particularly fun for kids are its petting zoo area, splash park decked out with super-sized insects, and a viewing area where you can see the beavers inside their lodge. For the adults, getting to the chance to witness two polar bear cubs romping about with their mother was a major highlight. For more info, check out the first 2 minutes of this YouTube clip and feel free to ask me any questions in the comments and I’ll do my best to answer them! Julie is a married mother of two children aged 8 and 2. Although she used to be a big camping buff, time has changed her and she has been recently trying to resurrect this love for sleeping outdoors. You can see her daughter's tips for camping with kids on Kids in the Capital, or read more at her personal blog Coffee with Julie.